Tim Duncan's San Antonio Spurs have spent yet another year as the model of NBA efficiency. 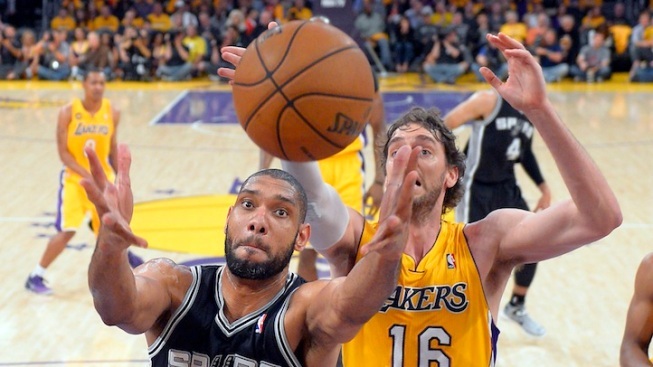 San Antonio Spurs forward Tim Duncan, left, battles for a rebound with Los Angeles Lakers forward Pau Gasol, of Spain, during the first half in Game 3 of a first-round NBA basketball playoff series. While the Los Angeles Lakers have been a jumble of injury, inconsistency and general weirdness throughout their tumultuous season, Tim Duncan's San Antonio Spurs have spent yet another year as the model of NBA efficiency as they grind out wins with their usual dominance. It's not tough to guess which team has the other on the brink of playoff elimination — particularly with Steve Nash watching in a suit and Kobe Bryant sitting in the training room. Duncan had 26 points and nine rebounds, Tony Parker added 20 points and seven assists, and the Spurs beat the Lakers 120-89 in Game 3 on Friday night, the worst home loss in Los Angeles' lengthy postseason history. A largely silent Staples Center watched San Antonio bully the Lakers to the precipice of first-round playoff elimination for the first time since 2007. The short-handed Lakers played without their top four guards due to injury, and the Spurs posted their biggest win of a series thoroughly controlled by coach Gregg Popovich's playoff-tested club. "We respect these guys, and we're not trying to give them any momentum whatsoever," Duncan said. "We try to play the whole 48 (minutes), and try to play it the right way. We don't want to build their confidence, and they don't get their rhythm." The Lakers exceeded their 29-point home loss to Portland on May 22, 2000, the previous worst home defeat for the 16-time NBA champion franchise. Staples Center's lower bowl was half empty in the final minutes, an unfamiliar sight in an arena used to celebrating championships. San Antonio led throughout the final 44 minutes, going up by 18 in the first half and 25 early in the fourth quarter with its smooth, flexible offense. Tiago Splitter limped to the Spurs' locker room late in the third quarter with a sprained left ankle, but not much else went poorly for San Antonio. "I think we're playing fairly well," Popovich said. "Whether the team you're playing is whole, or banged up like the Lakers are ... we have to bring the energy and the professionalism to play." "It's been a very tough year, but we're not going to make any excuses, and we're not going to quit," Dwight Howard said. "We're not going to hold our heads down because of the things that have happened this season." Howard had 25 points and 11 rebounds, and Pau Gasol added his first career playoff triple-double with 11 points, 13 rebounds and 10 assists, but the Spurs barely seemed to notice. Andrew Goudelock scored a career-high 20 points in his first playoff start, and fellow starter Darius Morris scored 12 of his 24 points in the blowout fourth quarter. "We've been murdered by injuries, and it's tough to overcome that," Gasol said. "We're extremely short-handed." With Bryant and Nash joined by Jodie Meeks and Steve Blake on the injured list, the Lakers started Goudelock, signed from the NBA's D-League 12 days ago, and Morris, who barely played for long stretches of this season. The young guards didn't play poorly, but they weren't enough to overcome Duncan's dominance and Parker's continued move back to top form. "The first half, we gave everything we had, and it obviously wasn't enough," Los Angeles coach Mike D'Antoni said. "I thought our guys played as hard as they can play." The Lakers' tumultuous season appears to be drawing to a merciful end, since they're nearly out of healthy players after beginning the season with a star-studded roster and championship aspirations. Nine of the Lakers' 15 players were on their injury report for Game 3, and Metta World Peace played despite getting fluid drained from a cyst behind his surgically repaired left knee. After the game, World Peace said he'll probably sit out Game 4. Bryant attended the game, hobbling through the Lakers' locker room before the game with crutches and a large walking boot on his immobilized ankle, but didn't join Nash, Blake and Meeks watching in suits at courtside. The Lakers were forced to rely on Goudelock, their second-round draft pick from two years ago who spent this season in the D-League until Los Angeles signed him 12 days ago, and Morris, another second-year pro who barely left the Lakers' bench for long stretches this season. Goudelock, the MVP of the NBA's D-League this season, put up plenty of points with ample opportunities to shoot, but Parker largely matched him while Duncan thoroughly outplayed Howard and Gasol down low with his timeless game as the Spurs pulled away. San Antonio jumped to an 18-point lead late in the second quarter with steady offense from 10 scorers, while the Lakers had an understandable lack of chemistry. Goudelock started slowly, but scored 10 points in a 2:25 burst late in the second quarter to trim San Antonio's halftime lead to 55-44.